Miller et Bertaux is not a high-profile perfume company, at least not in the U.S. The U.S. perfume market is tiny compared to Europe, so that’s not a disaster for Miller et Bertaux, but it is a shame more people here don’t get to try Miller et Bertaux’s high-quality (in style and substance) fragrances — any of which I would happily wear (how often can I say that?) I’m particularly fond of: #2 Spiritus/land; #3 Green, green, green and…green; a quiet morning; and Om: inspire...and smile. 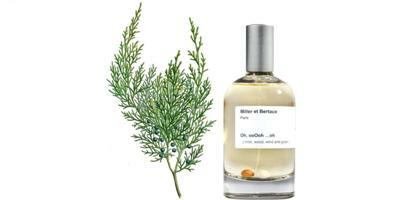 Miller et Bertaux’s latest perfume is called Oh, ooOoh…oh (mist, wood, wind and guitar)*; it goes on smelling spicy — as if you took some super-aromatic gin and boiled away the alcohol to accentuate the aromas of juniper berries, pungent citrus peels and herbs in the liquor (there’s a wonderful-smelling cinnamon-pepper component too). Oh, ooOoh…oh’s opening also reminds me of a rich, dark amber-colored artisanal ginger ale I drank recently; its vibe is warm and comforting…but not heavy. As the perfume dries down I smell leather (with maybe a touch of saffron), musk and a beautiful sequoia/cedar accord supplemented with silky-smooth, sweet smoke. (If you love the Comme des Garçons incense line, do try this.) Oh, ooOoh…oh is a well-blended perfume; all parts combining seamlessly during its development. Like the other Miller et Bertaux fragrances, with the exception of Green, green, green and…green, this is a subtle perfume — long lasting on skin, but not very diffusive. On the days I wore Oh, ooOoh…oh, I got more compliments (most delivered on elevator rides) than with any other perfume I’ve worn in a long time — if it came in a 50 ml size, I’d own a bottle by now. Miller et Bertaux Oh, ooOoh…oh Eau de Toilette is available in 100 ml ($145). * The listed notes include Seville orange, juniper berry, gin, musk, leather, moss, sequoia, cedar, cistus labdanum, balsam, smoke, absinth. When your elevator mates complimented you, did you tell them you were wearing “Oh, ooOoh…oh”? Seems like that could lead to some humorous misunderstandings. BG : I said that the FIRST time…only, then it was Miller et Bertaux! Thankfully it is for sale here in Seattle…so I could give them a shop name too. Really? Where as I would love to try it. Is it in the downtown area or posh Capital Hill? Miette: Essenza in Fremont…call first; they carry the entire line. Hemlock…I’m sure the first person thought I was making fun of them. Merlin…I could have gone with ‘mist wind wood guitar’…or is that even more ludicrous? I love the idea of long lasting but not terribly diffusive fragrances, things that hover closely around the wearer like an aura. This sounds like a must try for me. I love all the CdG Incense Series, and you make this one sound different enough to make me want explore it. (Though my family would question *why* I’d find smelling of cedar, gin and juniper interesting fun, but that’s another discussion.) Be well! HS : you too…and hope you enjoy it. Sounds like one worth trying for sure! I dig a lot of those notes…ooooh.. I think of the Pillsbury Dough Boy..’oooh ahh oooh poppin fresh dough, teeeeheee’. Omega…I was imagining soft, whispery, hesitant ‘oh’s’…ah! Thanks for the great review, Kevin. I’m a long-time reader who finally got around to registering today. I am familiar with Miller et Bertaux, and No. 3 Green, Green, Green and …Green is one of my all time favorite scents. In fact, it was my first non-mainstream purchase back when I began my perfume collection. I wear it a lot during summer. This one sounds like another good scent. Does it feel season-specific, or the kind of thing you could wear any time of year? If I might be so bold as to be nosy, what was this artisanal ginger you imbibed? It sounds heavenly.